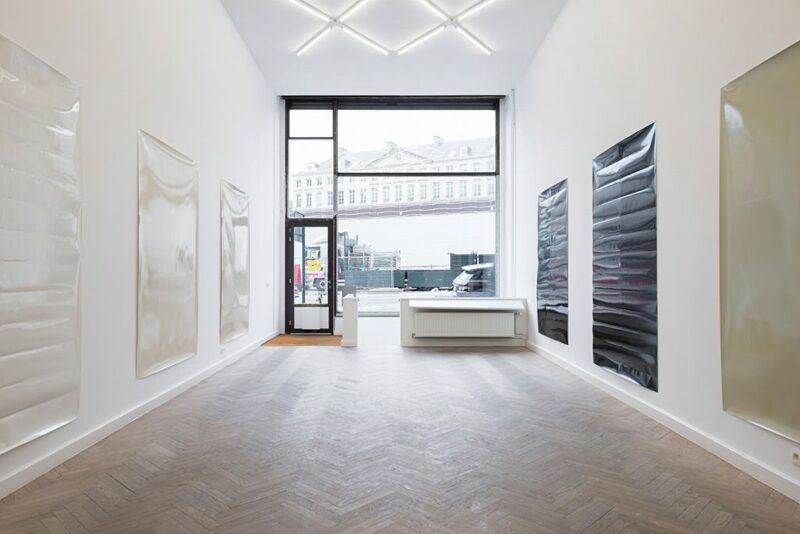 Office Baroque is pleased to announce the second solo exhibition of Davis Rhodes at our midtown gallery on Ravensteinstraat 44 Rue Ravenstein. 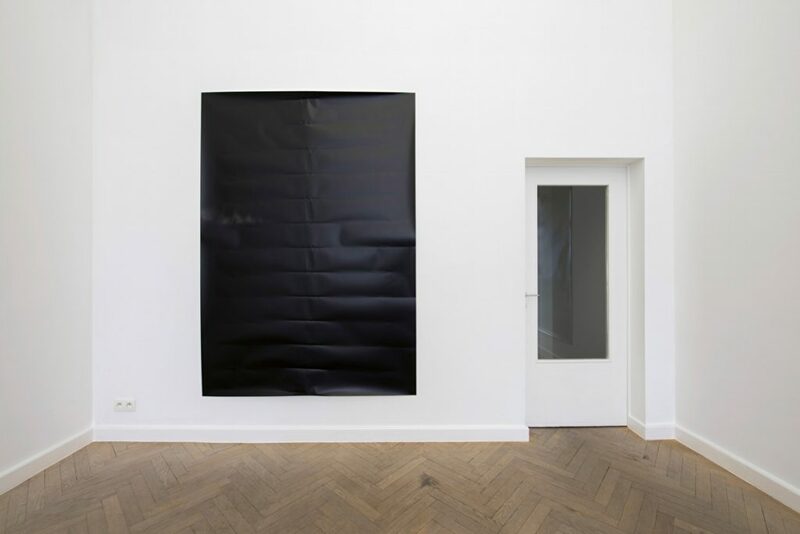 Rhodes’ solo exhibition at the gallery debuts a new series of large format paintings on photo inkjet paper that continue the artist’s interest in un-grounding the grammar of the painted surface through an accumulation of specific material interventions. Painted with acrylic spray enamel and affixed directly to the wall, each work is cut from a roll of standard width 60-inch Epson paper. 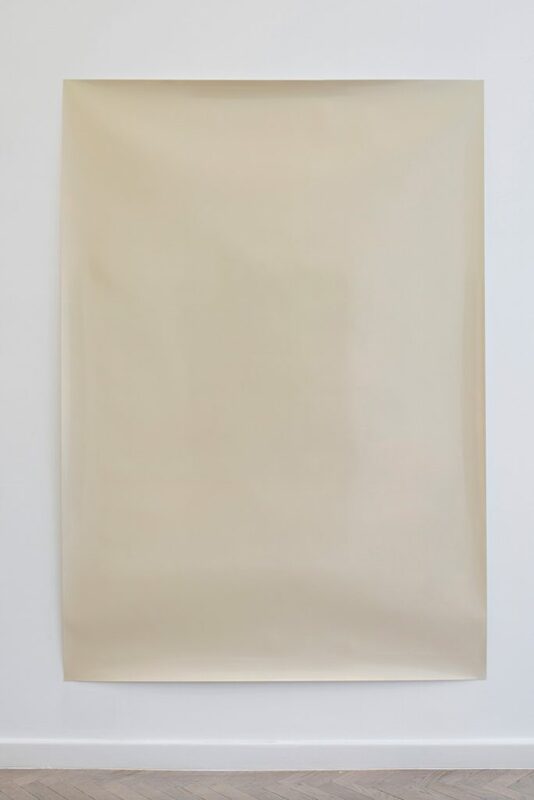 Here the unprinted front face of the paper is turned against the wall, while the verso side serves as a non-porous plastic substrate which, when painted, achieves the uniform reflective sheen of an industrially produced surface. 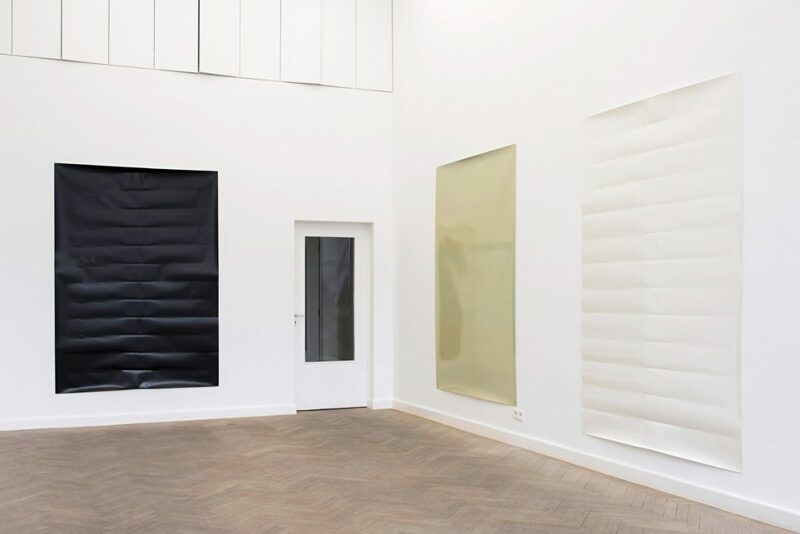 The works in the exhibition form two distinct, parallel series. 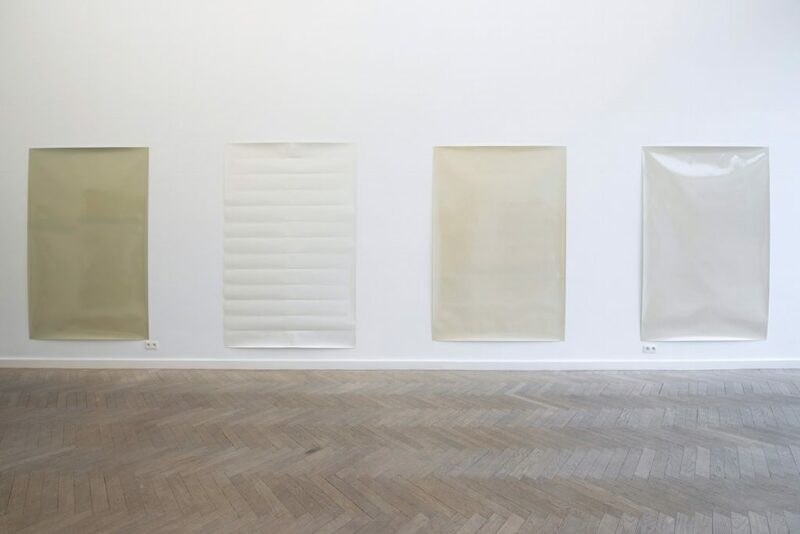 Paintings in beige and tan are internally divided into frontally stacked horizontal bands that have also appeared in Rhodes’ earlier work. Each roughly a third of the overall composition – the equivalent area covered by a single can of spray paint – the bands are now articulated via barely perceptible seams in the surface and fluctuations in hue derived from aberrations in the commercially available paint mixtures. 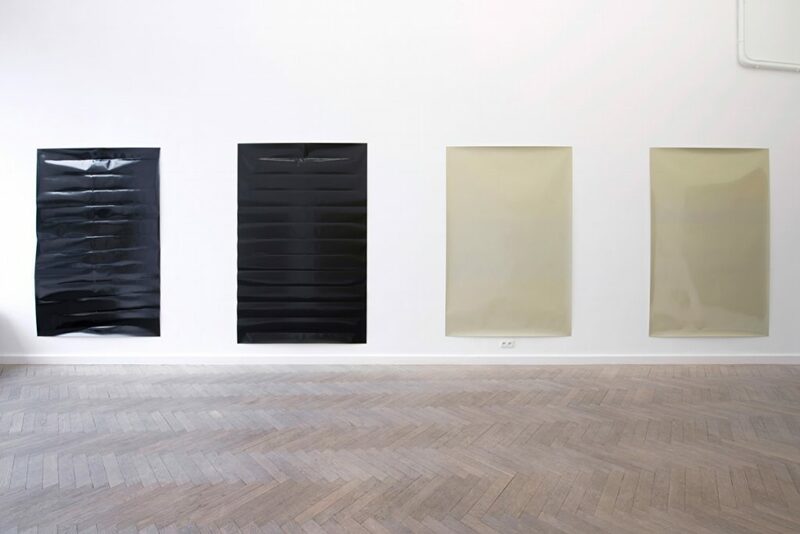 These are shown alongside folded works in satin and high gloss black, which have been rolled and crushed to yield a composition of irregular striations, stacked horizontal registers. What seems to be dynamic contour and convex volume belies the thinness of the works’ actual margin of depth from the wall. 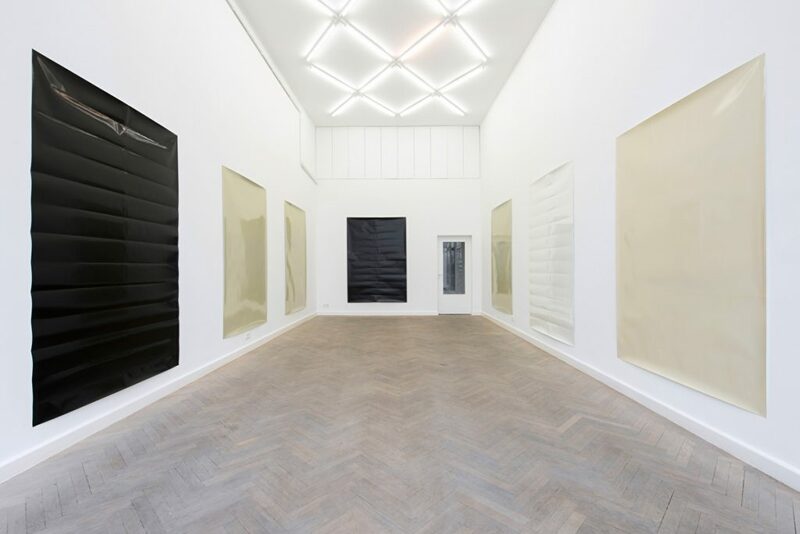 Taken as a whole, the works in the exhibition isolate and display the painted surface, putting pressure on its codes, limits and historical moorings. Exposed and immediate, the planar surface here is a disembodied projection, a carrier of bare operations traversed by heterogeneous codes. Davis Rhodes was born in Victoria in 1983 and lives and works in New York. 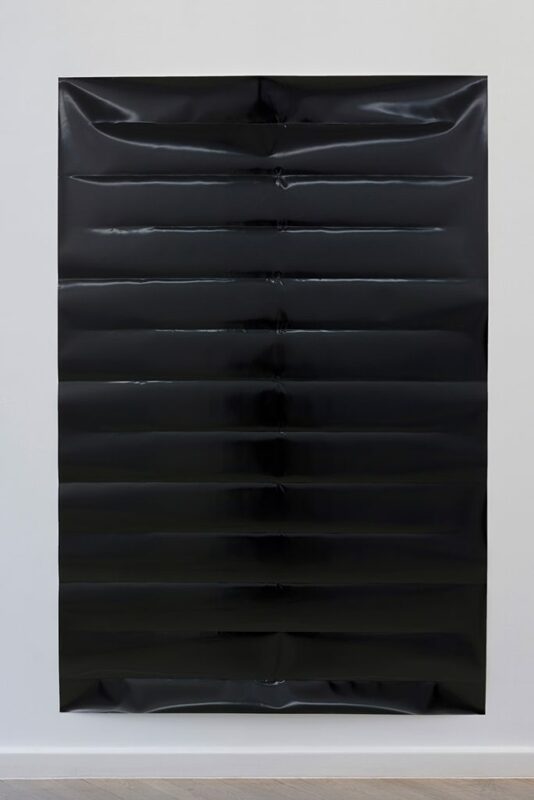 His work has been the subject of solo exhibitions at Société, Berlin and Team Gallery, New York. 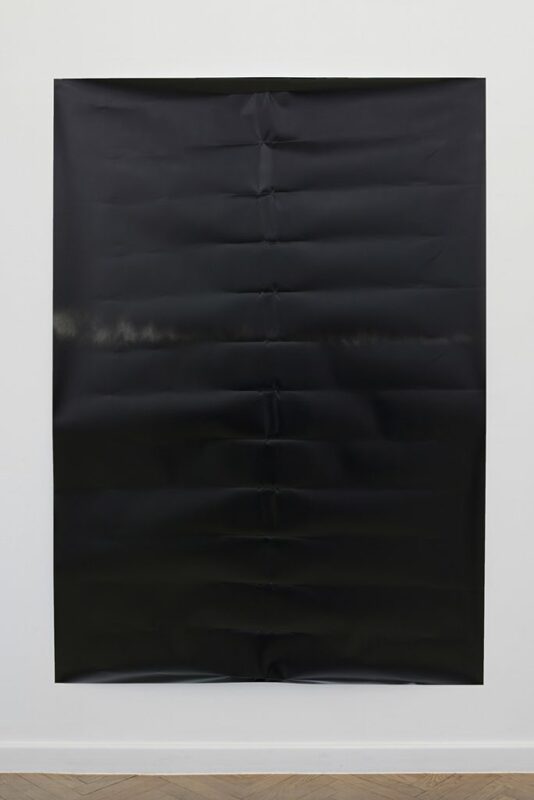 His work has appeared in group exhibitions at the Cressman Center for Visual Arts, Louisville; Eva Presenhuber, Zurich; White Flag Projects, St. Louis; Sammlung Haubrok, Berlin; MuZee, Ostend and The Kitchen, New York. Enamel on photo inkjet paper, 228,6 x 152,5 cm (90 x 60 in.). Enamel on photo inkjet paper, 215,9 x 152,5 cm (85 x 60 in. ).